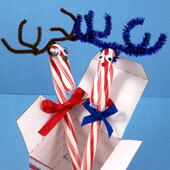 Children will enjoy transforming a candy cane into a reindeer using a few craft supplies and a bit of glue. This reindeer is a great decoration for the tree or a fun party favor. 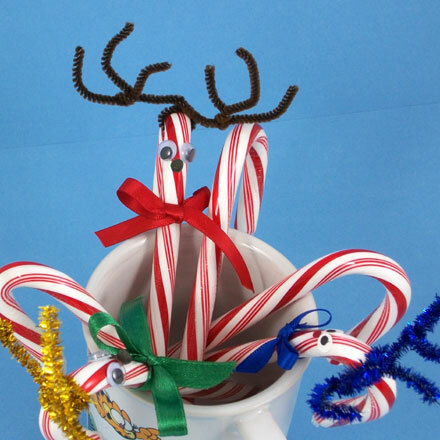 It's a craft that has long been a holiday favorite for kids and teachers alike. This project is perfect for family, classroom or group craft time. It is very inexpensive, even when crafting in large numbers for a class. With a little preparation by the adult or teen leaders, this craft can be completed in no time. Related craft: For another Edible Craft, and some holiday fun, check out Chocolate Spoons! Optional: For younger children, use hole punches (1/4" and 1/8") in place of wiggly eyes and pompoms. 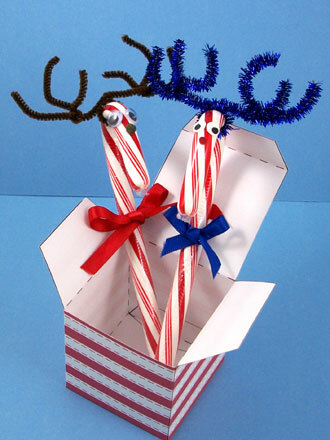 Read through the project and gather the materials needed for making the candy cane reindeer. If you are doing this craft with a group, precutting the chenille stems and ribbon will make the craft go faster. 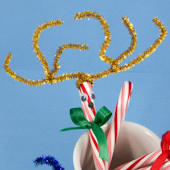 Decide whether you want the reindeer's face to be on the front or the back of the candy cane hook. It is usual to make the candy cane reindeer with the face on the front of the hook, but it looks better hanging on the Christmas tree with the face on the back of the hook. Tip: For younger children, the wiggly eyes and tiny pompoms are choking hazards. Reindeer with eyes and noses made with hole punches are just as cute. To make eyes from cardstock, glue black circles punched with a 1/8" hole punch to white circles punched with a 1/4" hole punch. Use the 1/4" hole punch to punch circles for noses. 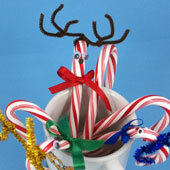 Glue two wiggly eyes (or punched eyes) on the front or the back of the candy cane hook. Tip: Leave the wrapping on the candy canes, so they can be eaten later. Glue a brown or red pompom (or punched circle) below the eyes as a nose. Cut a length of ribbon 8" to 12" long. Tie the ribbon into a bow on the straight part of the candy cane. Cut a 12" chenille stem in half, then cut one half in half again to make three pieces total. Bend the longer piece of chenille stem in half, place the top of the candy cane hook in the bend, and twist to secure. Be sure to make both sides equal lengths. This is the main part of the reindeer's antlers. Take one of the shorter pieces of chenille stem and wrap it around the left antler. Repeat on the right side. Adjust the chenille stem pieces to look like antlers. You're all done! Why not make one for everyone in the family and for all of your friends? Thanks to Kim for sharing this craft idea with Aunt Annie's Craft Exchange in 1997. Kim shared, "This craft project makes a great class take-in and doesn't cost a lot. Even the teachers like it. It can be used to decorate the tree, packages, or just as a fun piece of candy for the kids to eat, and it is so easy the kids can help make all you need for the season." Tip: For younger children, make eyes and noses with paper hole punches. Tip: For extra big antlers, use two chenille stems. Leave one stem whole and cut the other one in half. 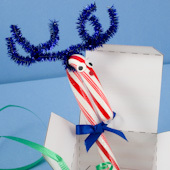 Tip: The reindeer face can be made on either the front or the back (shown) of the candy cane hook.